Once your taste for smoke has developed, the next step is to experiment with the Weber Smokey Mountain Cooker. Weber’s smokers are designed to cook food over an extended period of time, allowing you to slow-roast meat and fish for that delicious smoke house flavour! Inject exciting flavours into your cooking with this distinct barbecue, a method that has become well known for classics such as pulled pork and ribs. Cooking ‘low and slow’ keeps the juices and flavour in your food that will eventually produce an extremely tender piece of meat. The Smokey Mountain Cooker comes in three sizes: 37cm, 47cm and 57cm models and with two cooking grates the cooking area is extensive! 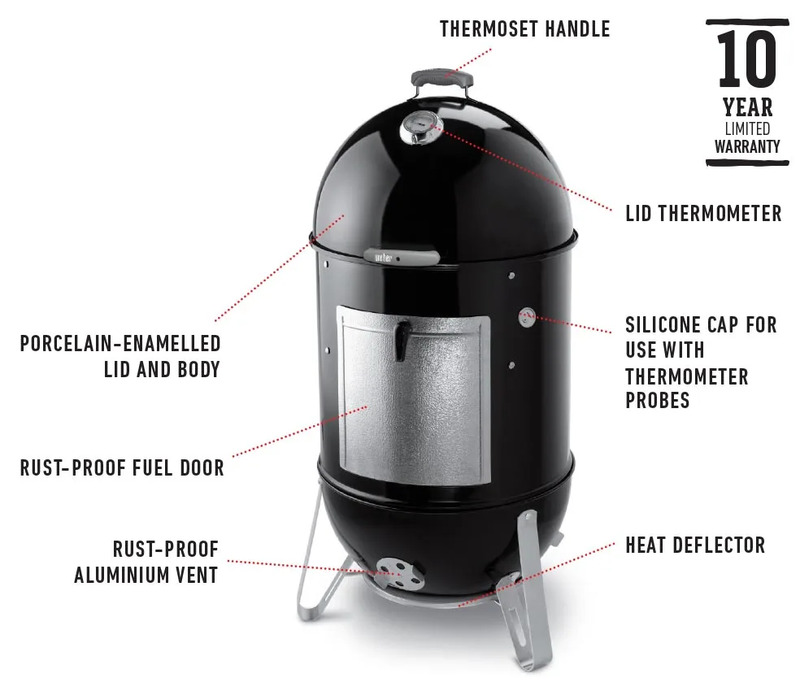 For that truly delicious, authentic wood-smoked flavour – this unique Weber Smoker allows you to slowly cook meat, poultry and fish to perfection. Experiment with new taste sensations, thanks to our smoker range. Ideal for low ‘n’ slow cooking, our smoker barbecues will give you guaranteed succulent results every time, injected with distinctively delicious flavours. Built-In Thermometer – The durable, built-in lid thermometer allows for easy monitoring of your smoker’s temperature. Heavy-Duty Cooking Grates – Two plated steel cooking grates provide ample room for smoking ribs and a roast at the same time. Temperature Grommet – High-temperature, silicone grommet allows for easy access into the smoker for temperature probes. Porcelain-Enameled Water Pan – Adds steam to the smoking process so meat stays moist and tender. Charcoal Chamber – Designed to keep your charcoal in a concentrated area and in a uniform shape, helping to control temperature. TAKE UP SMOKING! Wood smoking your food is a great way to add an extra dimension to the flavour and our specialist Smokey Mountain Cookers have been designed specifically for this task. The Weber 37cm and 47cm Smokey Mountain Cooker has all the features of the Weber 57cm Smoker but with a smaller cooking area. Take a look at the Weber Firespice Wood Chips and the Weber Wood Chunks in our Smoking Accessories page. Available in Pecan, Apple, Cherry, Mesquite and Hickory. Buying a Weber Smokey Mountain Cooker is an investment, as Weber provide a limited guarantee of up to 10 years you can be assured that in the unlikley event that something goes wrong you have the backup of Weber's fantastic customer service.